MORE than 175 courses are currently on offer to students looking for post-Leaving Cert courses, traineeships and other back-to-education opportunities in Donegal. Donegal Education and Training Board (Donegal ETB) is featured on a new website showing all the further education and training opportunities available locally and nationally in one online location. The accredited programmes are being delivered by a network of further education and training providers while there is also an online option through the SOLAS e-college. Donegal ETB is the main provider of the courses in Donegal with about 175 courses and locations currently available throughout the county shown. 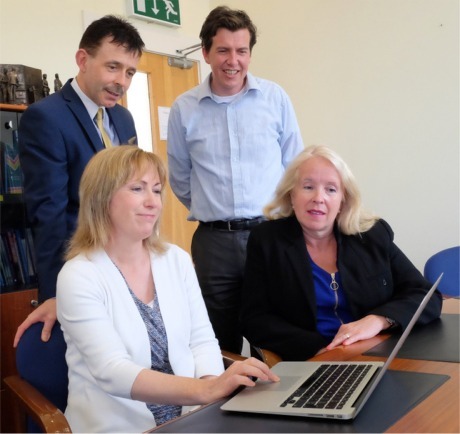 Pictured at the launch of the new website - fetchcourses.ie - are, seated from left, Donegal ETB ceo Anne McHugh and training services manager Mary O'Malley. Standing from left are education officer Dr Martin Gormley and training standards officer Charles Gorney. development for the further education and training (FET) sector as we now have a one-stop-shop which contains information on all the FET provision at a local, regional and national level. level which enable individuals to progress and develop their skills for employment, career progression, progression into other FET courses or third-level as well as providing fundamental literacy and numeracy and other essential skills." Donegal ETB centres can be found throughout the county including Buncrana; Letterkenny; the Gaeltacht; Ballyshannon; Donegal Town; Stranorlar and Milford. It also works closely with the network of community outreach, education and adult learner providers across the county. Meanwhile, some 4,000 further education and training courses are currently available nationally. They can now be found at the new one-stop-shop website, www.fetchcourses.ie .